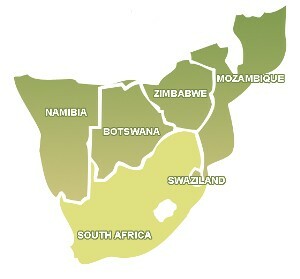 Go Bass Fishing in Africa is the most comprehensive Bass fishing site for Southern Africa. We provide detailed coverage of venues on public and private Bass waters throughout the region. Each lake, dam or river includes all the information that Bass anglers require to make the most of their precious fishing time. Make a selection below or click a region on the map for Bass fishing venues in that country. Bass fishing in Mozambique is in it's infancy but some great fishing is available. More info . . .
Comprehensive list of Bass fishing destinations in Namibia. More info . . .
Comprehensive listing of public and private bass fishing venues throughout South Africa. More info . . . The Kingdom of Swaziland offers some excellent Bass fishing in unspoiled surroundings. More info . . .
Zimbabwe, for all it's current problems offers out of this world fishing for BIG Bass. More info . . .